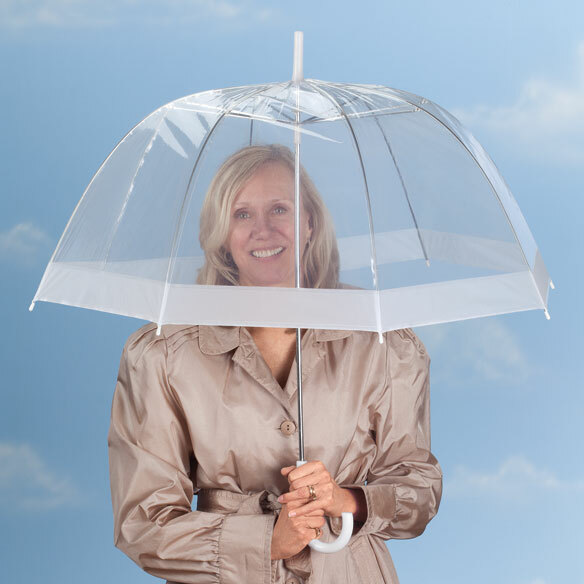 With the clear dome umbrella, you can see all around-even in a downpour! This transparent umbrella is ideal for sporting events, also for avoiding collisions. 100% plastic with metal handle. Manual operation. 34 1/2"L, 29" across when open. Assorted handle colors; we'll choose for you. Love this umbrella! It helps keep me dry in the rain and doesn't block my view. It's especially good for the little ones and they love that I put their names on it. It also comes in handy when I am watching them play softball. It blocks wind, slanted rain and you can see right through it! I love it!!! Great gift idea! Great item and great price! Great item! Used for a jellyfish costume on Halloween. It even rained so I got ultimate usage out of it. Aside from the holes I had to make in construction, it didn't rip and even held up an extra 5 lbs of materials. Got on a buy 2 cheaper deal so I will definitely give one as a reliable gift. Thank you for carrying this! This was given as a gift. So far, we have had no rain. But she still loves the umbrella. Clear view while walking in rain. Bought one for a gift. I use a walker so it is important that I have a clear view while keeping dry. I used to have an umbrella like this years ago, so happy to have one again! The design is great, keeps me dry and better protection in the wind due to the see through umbrella design! I love this umbrella. The street where my work is located, is a big wind tunnel. On rainy days this is the best thing ever. As I am walking down the street completely protected from the rain I see other's struggling with their standard umbrellas. I see standard umbrellas turning inside out as I am strolling along not having to struggle to hold on my umbrella. Being clear gives me full view of my surroundings too. Also my shoulder bag I carry is completely protected as well. Great for walking through New York City! Spent the day in New York City doing a walking tour of Central Park. It rained that day, but we didn't mind, we could still see everything through our clear umbrellas. Walking on the busy sidewalks was easy cause we could see and still stayed dry! Love it!! when drivers' view is impeded. Appreciate the reasonable price also. I bought one for a friend, too. Thank you, MK, you never disappoint. My daughter wants one, too. I bought a number of these and use them in the garden to protect my container plants from a hail storm. Cut off the handle crook and poke in into the pot works great!!!!!!!!!! All of the above is true and then some! of course, when it rains, I use this umbrella. You can keep your hair dry, shoulders dry and the upper part of your body dry. The best part is that you can see where you are going. Everyone who sees it, wants one. sand dry wall allowing dust to be 'captured' by the upside down Clear Dome Umbrella! REALLY. I wish it folded smaller. But, it's good the way it is! I love that the umbrella is a clear dome. This totally keeps you dry in the hardest rain and wind. It is clear so you can keep the umbrella low and still see everything. This is a great idea for an umbrella making it clear so you can see where you are going is fantastic. Thanks! I LOVE THIS UMBRELLA. I ORDER ONE AROUND CHRISTMAS FOR A GIFT AND USED MY CRICUT TO PUT MY DAUGHTER'S NAME ON IT AND THIS ONE I ORDERED WAS FOR MY GODDAUGHTER. THE ONLY THING IS YOU DONT KNOW WHAT COLOR THE TIP AND HANDLE WILL BE BUT THATS MAKES THEM UNIQUE. I JUST LOVE IT!!! My sister loved this umbrella! It is just her style. The handle on hers is white so it looks a little different than the one pictured. I had an umbrella exactly like this when I was a young girl. I LOVED Feeling like I was in my own little world since this umbrella protected so much of my body. As an adult and a mother (who is always attending my children's sporting events), I was so excited to find this classic umbrella for me and my daughters. I am so pleased with the quality of the umbrellas - especially for the extremely reasonable price. We are able to stay dry while watching my son play baseball. Unlike other umbrellas, this one doesn't interfere with the other spectators sitting behind us. I am confident that these will last for several years. Because of it's shape, you don't have to worry about the wind catching it and blowing it inside out. A great value for a great product! It covers more of my upper body well. I can see where I'm going with this umbrella. I really enjoy my my "bubble!" I love my "Bubble." It rains a lot, where we live, so I keep it, by the door to get the mail. But sitting in a pour down at an open air, forest theater, is what made me order one. People behind me never complain, about my clear, dome unbrella. The wind and rain are not in my face. I liked it so well, my daughter-in-law got me a second one for my birthday. This umbrella covers the whole upper part of your body and you can see through it while you are walking. It also is resistant to wind turning it inside out! I used to use similar umbrellas in college. I wondered why they were no longer made. I liked being able to see where I was going. With standard umbrellas, you have to raise an umbrella to see in front of you, and then you get rained on. I also think these umbrellas are cutesy. Let's hope they stick around this time! I got this umbrella for my wife and she loves it. It isn't heavy and she can see where she is going even in a downpour. Mostly, as indicated above, she uses it when she goes shopping, and very convienent for her. Thanks for this product. This product is definitely a good buy! Having used many "regular" umbrellas, this dome shaped umbrella helps on windy days, and rainy days. Keeps your view perfect too! I bought this umbrella for my daughter and she loves it!. Very good quality and adorable! I WAS GOING TO ORDER MY DAUGHTER A PERSONALIZED CLEAR UMBRELLA FOR CHRISTMAS AND EVERYWHERE I WAS VIEWING WAS RATHER EXPENSIVE SO I DECIDED TO ORDER THIS ONE WHICH WAS A VERY GOOD PRICE AND PERSONALIZE IT MYSELF WITH MY CIRCUT. IT TURNED OUT JUST WONDERFUL. Nice to see where you are going, especially if you are leaning into the wind. These are great! I bought 2 as gifts! I work in a major city and its great to have full coverage yet you can still see where you're going. Good stuff! Had an umbrella like this when I was a teenager. Really liked it. Gave this one to a friend as a gift and she loves. She says she really likes it because when it rains, and the wind is blowing, she doesn't get wet, and her hair stays in place. The staff helped me expedite the order so efficiently. The umbrellas were here so quick and packaged well. I remember these umbrellas from long time ago. I loved these umbrellas long time ago, and still do. So happy to find this in the catalog. I haven used it yet, but definitely will. It's great to be able to see where you are going even if tilted in front of you. LOVE LOVE IT. So pleased with this item! I had one from my Mom years ago... best umbrella ever! Got this for me but I was to big for it so I gave it to my 8yr. old granddaughter for her to use while waiting on the bus and she LOVE it cause it fit over to keep her back pack dry too . Good at keeping the rain off. I had on back in the 60s, so got a new one. (I sort of collect umbrellas.) Doesn't seeem as deep a dome, but it has its uses. When visibility is poor (fog, snow, heavy rain) it's harder for motorists and even other pedestrians to see you, so you have to keep an eye out as much as possible. The very young and older people tend to forget to look up from under regular umbrellas -- no problem w/ this one! Had a downpour the day after I received this umbrella. I got caught in it and had to walk a block to my door. The only thing that got wet was the lower half of my slacks. in foggy or rainy weather.you can be protected from the weather and at the same time see all around you. Had one similar to this for a long time and it broke. This umbrella seems a bit 'lighter' in construction than my original one, but I still like it. Great see through umbrella. Extra large size too, great for coverage. You do have to close it just before you sit down on car seat. Too large to close it between seat and open door. Although it is no longer raining in Northern California, I know that I will be getting a lot of use out of this umbrella when it does. I am prone to falling; therefore, seeing where I am walking is mandatory. This see-through umbrella is just the ticket. Cute & clear but not so sturdy! I purchased these umbrellas to use for a prop in a program at my elementary school. One had spokes coming loose during the first practice. I put them back in and they lasted through the second practice. However, during the program...two of them had spikes that came loose again...so the umbrellas never fully opened! I attend a lot of Grandchildrens base ball games. It is VERY windy where I live, making sttending most games very cold this spring. I keep the wind off my face., ears, head and can still see the game!! I'm the envy of all the cold people at the ball park!! It needs some improvement...a little hard to open and it comes apart at the end of the prongs. I have purchased this product from this catalog before, and have been quite pleased. I use it quite often while waiting for my bus and working to work through the city. I love the style and shape of the umbrella, but they do break easily (probably because of the shape and tension on the metal pieces) so I reorder probably once a year. However, this time I was disappointed with the purchase. The item received was different than the item pictured and different than the umbrellas I have received in the past. The color of the handle and top were bright white instead of black, and the umbrella seemed to be smaller. It seemed like a child's umbrella as opposed to something a professional would use. I bought a few of these umbrellas to sell in my store even after reading some of the mixed reviews. The white lining unattached from the plastic VERY easily. I will not be purchasing any of these again. I will find a new supplier. I purchased this because I loved that it was a dome and you could see through it. I was looking forward to using it. The first time I opened it, the wind was too much for it and it immediately broke. Just opened it up for first time and the cheap aluminum pole through the middle was bent. And it was not a dome umbrella, it was just a regular umbrella. Zero stars from me. While I like the concept of the clear dome... the umbrella simply does not last long. The ribs broke way too easily and the umbrella cannot open or close easily. Just got two uses out of it and into the trash bin it went. better off getting the subway specials in the city for $3 since I know they won't last. And since Miles Kimball apparently changed their return policy to 45 days only, I couldn't get a refund or exchange. I would never buy this item again. The product was damaged. I didn't send it back because I threw the box away. The deduction of shipping & handling would barely leave a refund. So it was not worth the hassle. The entire product is cheap and poorly made. Please discontinue this product. Thanks. Only good for a light rain with no wind. This product is cheaply made and it blew inside out the very first time I used it. First time I used the umbrella it was for a misty rain with no wind. One of the metal ribs had come out of its plastic holder after walking in to work. Put it back together. Used it a couple times during the day to walk between buildings at work. The metal rib came out again and then it became more difficult to close. Had to really shove it to close. By the end of the day two metal ribs had come out and I could hardly close it. It is a cheap imitation of the "bubble umbrella" from years ago. Concept is great being able to see through the umbrella but construction is terrible. We only had this for two days. The first time we opened it, two of the spokes broke. We could not fix it and threw it away before the next day. So disappointing!!! Looks like it will work very good when I use my scooter. Able to see where I'm going without getting wet. The protect my potted plants from hail. Expect it to be useful from power wheel chair. ls it in store ? BEST ANSWER: Thank you for your question. We do not sell in stores. We hope this information will be of help to you.